Protect yourself and your family from pathogenic germs. 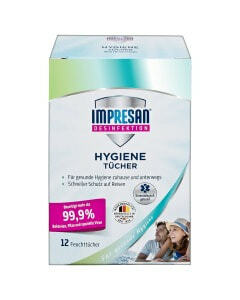 This classic hand sanitiser from IMPRESAN ensures reliable and healthy hygiene. It eliminates more than 99.9 per cent of specific bacteria, fungi, and viruses. Your hands deserve special attention for reliable and healthy hygiene. They are known to be transmitters of pathogenic germs. With the IMPRESAN Hand Sanitiser, you eliminate more than 99.9 per cent of specific bacteria, fungi, and viruses. The Hand Sanitiser is bactericidal, tuberculocidal, yeasticidal, and even offers limited virucidal properties. * For reliable hygiene, observe the application time of 30 seconds. Suitable for about 50 applications. * The effectiveness in in-vitro tests against the BVDV and vaccinia viruses in accordance with the recommendation of the Robert Koch Institute allows a conclusion to be drawn with respect to the efficacy against other enveloped viruses, such as the hepatitis B, HIV, and influenza viruses. of specific bacteria, fungi, and viruses*. Count on reliable, healthy hygiene for your hands. All IMPRESAN Hand Sanitisers are based on alcohol and eliminate specific bacteria, fungi, and viruses. Put 3 ml of the undiluted solution onto dry hands. Rub thoroughly between hands for 30 seconds until completely covered. Keep hands moist with the undiluted solution while it is taking effect. ATTENTION: Flammable liquid and vapour. Causes serious eye irritation. May cause drowsiness or dizziness. If medical advice is needed, have product container or label at hand. Keep out of reach of children. Keep away from heat/sparks/open flames/hot surfaces. – No smoking. IF IN EYES: Rinse cautiously with water for several minutes. Remove contact lenses, if present and easy to do. Continue rinsing. Store locked up. Dispose of content/container in compliance with local and national regulations.